This is the family home at Edgevale, a farm and orchard at Independence near Phoenix, Oregon. 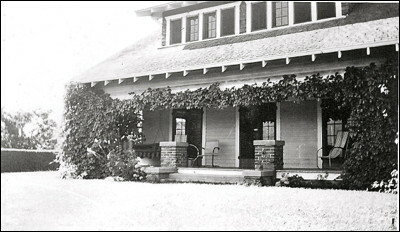 My grandparents Daugherty first lived in a nearby smaller house until the owner moved to Portland. Then my grandparents moved into this house and took over management of Edgevale. My mother was born here in 1921 and attended nearby Independence School. During Prohibition, this main house operated as a pretty classy speakeasy. When my grandparents built their new home on Kings Highway on the outskirts of Medford, my grandfather built a secret, well-ventilated room behind the living room bookcase where he operated a small moonshine still.